I have hunted primarily with handguns now for over 20 years. I have been a hand loader and bullet caster for that same period of time. While I started off handgun hunting with high-performance wildcats, loaded with jacketed bullets, it was only natural that cast bullets would creep into the spotlight in my hunting loads. There is a very real satisfaction that comes from casting one’s own bullets, and from assembling accurate useful ammunition from those bullets. It’s only natural to start thinking about how a hunting bullet should be configured and making some custom mould designs to try out in the field. That satisfaction grows when highly effective hunting loads are built around those hand-cast bullets, and grows even greater when those hunting experiences are shared with good friends. This is a story of such bullets and such friends. There are three bullets that play a part in this story -- all three weigh more than 200 grains, all three are cast hollow points (HPs), and all three are routinely loaded between 1300 and 1600 fps. A fine recipe for making meat! 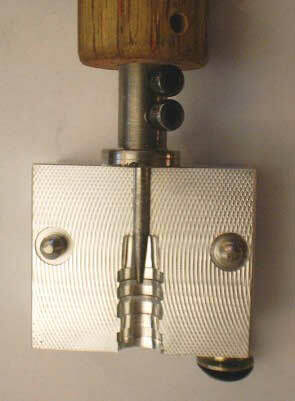 The first of these bullets is made using a custom-made mould that Bruce A. Brandt made for me a while back. Bruce runs BRP Enterprises (LLC) and he makes a wide variety of mould designs (BRP Products, LLC; 616-667-2427). One of the bullet designs that he’s made a cherry for is the Lyman 358627, the 215 grain SWC-GC that Lyman made for the .357 Maximum and IHMSA competition. I bought a 2-cavity Lyman 358627 back in the early 90s and have shot that bullet in everything from the .38 Special to the .350 Remington Magnum -- it’s a very accurate and versatile cast bullet design. While the 358627 is one of my favorite cast bullet designs for the .357 Maximum, I have always wanted to get a HP version of this bullet, and given that Lyman is no longer making this mould, I am reluctant to modify the original mould I have. This is where Bruce comes into the picture. It turns out that he made a cherry that duplicates the 358627 design AND he offers his moulds in HP form. An order was placed forthwith. .357 Max loaded with the 358627 HP. After the mould arrived I sat down and cast up a batch of bullets to a hardness of a BHN of about 11. They dropped from the blocks at .360” and they weighed 209 grains. I sized them .357” (my Ruger has tight throats), lubed them with my home-made moly lube, and checked them with Hornady crimp-on gas checks. Various test loads were assembled using IMR 4227, Acc. Arms 1680 and Winchester 680. The best load tested was 19.0 grains of 4227, which is very accurate and generates about 1500 fps from my 7 ½” Ruger. The second bullet in this story is a HP version of the Lyman 33889. Back in ‘93 JD Jones helped me bring a wildcat cartridge to life. 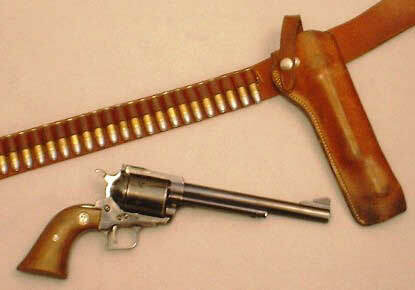 The .338 GEF is based on the .356 Winchester case necked down to .338 with the body taper and shoulder blown out. From a 12” Contender the .338 GEF can launch the 200 grain Nosler Ballistic Tip at 2100 fps and the 250 grain Partition at 1900+ fps. 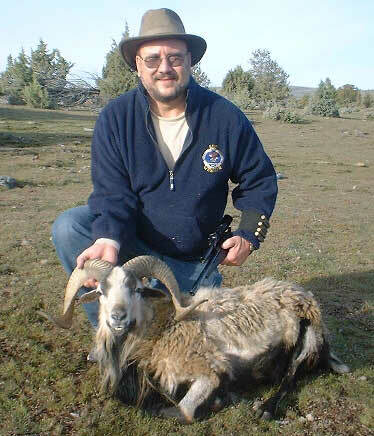 I’ve used the .338 GEF to take mule deer, pronghorn antelope and feral hogs. It works. Quite nicely, in fact. Not surprisingly, I wanted to find a good cast HP mould to feed my pet wildcat with. Well, the answer was found in the form of a single-cavity Lyman 33889 mould that I found for cheap. I took a piece of ½” aluminum round stock and turned a mandrel to fit the mould cavity and clamped the mould blocks onto this mandrel and drilled the channel for the HP pin using the tailstock. I chose to make a .135” diameter pin that extended .500“ into the bullet’s nose, tapered at about 5 degrees, with a rounded tip. 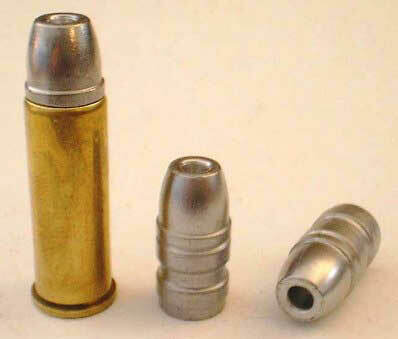 When cast to a BHN of about 12-13, these bullets drop from the blocks at .340” and weigh 240 grains. I size them .340”, lube them with home-made moly lube and check them using Hornady GCs. My favorite load for this bullet is 46.5 grains of H4831, which generates right at 1600 fps (See The 338 GEF Revisited). This is not a maximum load pressure-wise (nowhere near), but this is about as fast as I can go with the 1 in 10” twist and maintain top shelf accuracy with this cast HP. This load is very accurate and 1600 fps is a very useful velocity for a cast HP. I have used this bullet to kill a feral hog and a mule deer and have complete confidence in it for medium game -- it expands well and exits. The third bullet of this trilogy is based on the RCBS .44 300 grain GC-SWC. A while back I sent this mould off to my good friend Erik Ohlen; Hollow Point Mold or email, (541)738-2479) with the instructions to convert it to a 2-cavity Cramer style HP mould (See In search of the perfect bullet), with a .150” diameter mouth, 7 degree taper, a cavity that extended .250” into the bullet. The mould showed up a short time later, modified exactly as requested. Let me tell you, the Cramer system let’s you cast a heap-big pile of HPs in a hurry! These bullets drop from the blocks at 297 grains. I size them .430” and load them over 21.0 grains of 296 in .44 Magnum cases for about 1350 fps (depending on barrel length). I used this bullet to kill a smaller hog last year, and it performed beautifully, but I wanted to try it on something a little larger this year. And it turns out that a very special 7 ½“ Ruger Old Model Super Blackhawk that I bought earlier this spring from my friend Mark just so happens to shoot this bullet to point of aim with the rear sight bottomed out. I love it when a plan comes together! RCBS 300 Gr. HP and loaded round. Hunting season is a special time for me -- the angry clouds of autumn, the turbulent changing weather, the cold mornings and crisp sunrises, and the promise of seeing game when you least expect it. But I’m a Southern Boy at heart and historically Spring has been typically set aside for slower, more relaxed activities like fishing for catfish or bass. I don’t fish as much as a I used to (the word “pathological” comes to mind…), but I still like to get outdoors and stretch my legs a bit. Anymore, I like to get out and do a little light-hearted hunting. Since there are limited spring hunting seasons for game animals, this commonly means patronizing a fee hunting ranch. And since I’m a Southern Boy at heart, this commonly means hunting feral hogs (I love Carolina barbeque!). This spring I tried to coordinate hunting trips with a couple of my friends, but their schedules turned out to basically be incompatible, so I ended up scheduling two trips down to Clover Creek Ranch in central Oregon. For the first hunt, I would be hunting with my friend John. I had decided to take a Corsican ram. I’ve always admired the colors, the mask, and the beard of the Corsicans, and I was specifically looking for something with approximately full curl and an outward flair at the tips. Corsicans aren’t very big animals (~100 lbs) and I figured the .357 Max, loaded with the 209 grain 358627 cast HP at 1500 fps would be just the ticket. The scoped .338 GEF Contender, loaded with the 240 grains 33889 HP cast HP would serve as my back-up gun for this hunt. 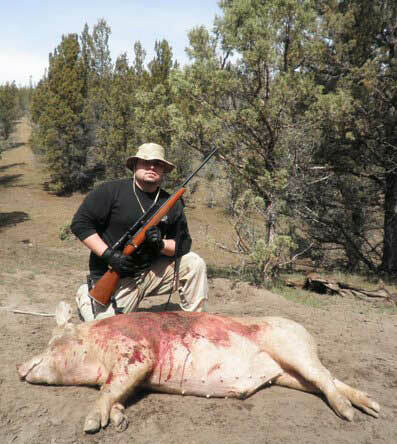 John wanted a meat hog and would be hunting with his .308 rifle, loaded with 180 grain Partitions at about 2600 fps. We got down to the ranch late afternoon on Friday, and got settled into the Bunkhouse. Dinner that night was a very simple, and very tasty recipe of andouille sausage, potatoes, onions simmered in gewürztraminer with a healthy dash of red pepper. Sweet, hot sausage ‘n spuds. Man, that was good! The next morning I woke John (that sleep-head!) up with the coffee pot perkin’ and the smell of sausage (from last year’s hog) sizzling’ in the skillet. We added scrambled eggs and bread, and ate like kings at O-dark thirty (I love breakfast in hunting camp!). Well fed, we headed up the hill into the ranch. We got up on top, into the big pasture, and crossed the muddy drainage to check out the other side, when we looked back over our shoulders and saw a large group of mixed sheep and goats (Corsicans, black Hawaiians, Oregon Dahl, Catalina, Merino, etc.) 600 yards away, up amongst the junipers on the slope behind us. The binocs revealed several good Corsicans in the group. We drove back to the muddy drainage and parked the truck back behind some brush, and got out. John was seriously jazzed as he wanted to see one of these rams up close and personal. I strapped on the .357 Max, loaded with Bruce’s 358627 HP at about 1500 fps and tried to put together a fairly direct stalk up through the junipers. I was able to work my way up the hill up to about 150 yards or so from the group, but they started getting nervous and weren’t going to let me get any closer. Time for Plan B. We went back to the truck, and then ducked around behind the back of the hill and then tried going up the back of the hill around to swing around in front of the group and come over the top of the hill, to surprise them on top. The stalk went very well and we came out in the middle of a broken up rock outcropping near the crest of the hill. The group was about 125 yards in front of us, milling about nervously on the slope in front of us. The stalk went well, the wind was in our favor, we hadn’t been “busted“, but the landscape was such that we couldn’t get any closer, so I chose to set up behind a rock outcrop and see if they might feed over in our direction. In fact, they did, but a couple members of the group caught a glimpse of me hiding behind the rocks and got real nervous. The group got all bunched up and started milling about nervously. I couldn’t get a clear shot, but I did see that there was a very good Corsican in the group that had the curl and outward flair I was looking for. The gun and the load were certainly up to taking a 100-lb Corsican at 125 yards, but it was still early morning, on a gray, overcast morning and I didn’t trust middle-aged eyes with iron sights to place the shot with the level of precision that I want, so I called off the stalk and John and I went back to the truck, laughing about Mother Nature’s sense of humor. Given the skittishness of this group of rams, I made an “executive decision” and decided to ditch the .357 Max and go with the scope-sighted .338 GEF Contender and the 33889 HP at 1600 fps. A group of yaks had fed up over the ridge that we had been using for cover for our previous stalk, and a whacky idea occurred to me. Maybe if we made it look like we were interested in the yaks, and paid no attention to the rams, we might be able to work up the hill and get within range for a shot at a nice Corsican. The yaks weren’t terribly “spooky” and we basically walked slowly up the hill directly towards them (ignoring the rams off to our right). The rams were still all bunched up. At one point there was a large patch of juniper between me and the rams and I did a smart right-face and marched right up to the junipers. Since most critters key on the upright human form, I laid down prone and belly-crawled around the left-hand side of junipers to a piece of greasewood that I had picked out to use as an impromptu field rest. At this point, the animals were bunched up, about 75-80 yards off. I quickly scanned the group to see which Corsican ram was what I was looking for. Across the front of the group there were three that were virtually indistinguishable (I couldn‘t help but think “Huey, Dewey and Louie“), and all had the traits I was looking for, but none of them presented a clear shot opportunity. I was not ready for what happened next. Suddenly the entire group started trotting towards me, quartering to my left. In the process one of the three I’d identified earlier broke out on the left side of the bunch and gave me a clear shot. I pulled the gun off the greasewood rest and rolled over into a roll-over prone position, swung the crosshairs onto his shoulder and snapped off a shot at about 40 yards. The 240 grain 33889 cast HP hit the Corsican ram audibly, and he went down hard. As I got up I instinctively reloaded the Contender. As I did, I replayed the shot in my mine and realized that I had rushed the shot and hit him a little higher than I would have liked. He was down, and definitely not going anywhere, but he was still kicking and struggling when I got to him, so I put a second 33889 HP through his lungs and all was quiet quickly after that. He was beautiful, and exactly what I had been looking for. Later, inspection of the wound channel confirmed that the first shot had raked through the chest, from the left shoulder and exited just below the right kidney. It had traversed just below the spine, rupturing the major blood vessels that travel along the spine. The spinal shock was what knocked him off his feet, and the hemorrhage would have ultimately killed him, but the second shot hastened things in a humane fashion. I was one very happy hunter, I had my Corsican. The fact that I had switched to a scoped Contender for a shot that ultimately could have been done easily with the iron-sighted .357 Max revolver was not lost on John and me, and we laughed about the “Irony of the Hunt” on the way down the hill (it’s easy to laugh when there’s meat in the truck!). From previous visits we knew of a remote spot up in the woods that was a favorite bedding spot for some of the hogs on this ranch. John and I worked our way through the woods to a spot above this area and slowly snuck into position where we could look over the dozen or so hogs that were bedded down there. John was looking for a good meat hog (about 300 lbs), and wanted to have the opportunity to look over several hogs and pick-n-choose what he was going to take (last year he basically took the first decent sized animal that gave him a good shot opportunity). Several of these hogs were considerably bigger than what he was looking for, and a couple of them were smaller, but there were 2 or 3 that would fit what he was looking for. One was bedded down front and center, with a dirt birm shielding his vitals, and the other two were farther back in the groups and milling about behind the bigger hogs and some brush. We were about 50 yards above the hogs and decided to try to move in a little closer. At about 35-40 yards we got busted, and several of hogs started to get up and stare in their squinty-eyed way at us to try and figure out what we were. It was about this point that the sleeping hog in front of us decided to wake up and stretch his legs. As he stood, John saw to it that he never regained his feet. The 180 grain Partition (44.0 grains of Winchester 748, 2600 fps) hit him behind the left shoulder, and he went down hard, squealing. Most of the hogs moved out, but one of them moved in and started slurpin’ up the blood from his dying brother (that’s hogs for you…). John’s hog died quickly, and we shooed the other hog off and got a few pictures. The 180 Partition had entered in the middle of the left side ribcage and exited a little farther back on the right side, taking both lungs and liver in its travels. There was basically a 1” core removed from this hog, from one side to the other -- he bled freely and died quickly. Clark came in with his 4-wheeler and picked the hog up and got it down to the skinning shed for us. John was very pleased with his hog and got lots of prime pork off of it. The next morning we boned out meat and packed it into coolers for the drive home. Later that week, we made some Italian sausage out of part of John’s hog and it tuned out really well. I was having a hard time making up my mind what I was going to go after on the second half of my spring hunt, and that Italian sausage did it for me -- a hog’s fate was sealed! Two weeks later, I met Bob down at Clover Creek on Sunday afternoon. Bob wanted to shoot a yak, specifically a cow yak (there was only one left and it was “on sale”). I would be looking for a meat hog in the 200-300 lb range. Bob would be hunting with his Ruger 77 .30-’06, loaded with 180 grain Nosler Partitions over a healthy charge of 4350 for about 2700 fps, and I would be hunting with the Old Model Ruger Super Blackhawk (that I had just bought from my friend Mark earlier this spring), loaded with the 300 grain cast HP that I had my good friend Erik Ohlen modify for me a little over a year ago. 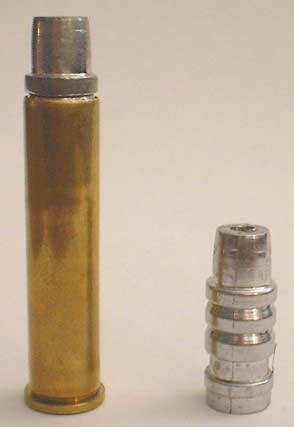 It would be loaded over 21.0 grains of Winchester 296 for about 1350 fps. First night’s dinner was Italian sausage (from John’s hog, taken 2 weeks earlier) in sweet basil marinara sauce over tri-color rotini pasta served with salad and a bottle of old vine zinfandel. Yeah, we were really roughin’ it! We built a campfire in the new fire-pit that Clark had built and then sat back and told hunting stories and listened for the coyotes. I woke up at 5:30 the next morning, turned on the coffee pot and started a some breakfast sausage on the hot plate (I like sausage and eggs). It seems some old retired folks are kinda grumpy when their morning routines get changed. Soon the bunkhouse was full of the smells of sizzling sausage and fresh-brewed coffee, providing motivation for Bob to drag his carcass out of bed. After breakfast was polished off, we headed up the hill, and into the ranch. We didn’t see any yaks at any of the places where John and I had seen them 2 weeks before (Clark had told us that there had been some hunting pressure on the yaks recently and their skittish behavior seemed to bear that out). We moved all over the ranch looking to see where the yaks had moved to and all we saw were 4 big bulls in the big pasture on top (Bob wanted a cow), so we swung down to the big catch basin at the bottom of a big bowl, to look around for the hogs, to see if I could find one in the size range I was looking for. As we worked our way up the drainage, we found one blonde sow, fast asleep, bedded down in the middle of a sandy wash, in a sunbeam. She went 325-350 lbs, and was a little bit bigger than what I was looking for, so we left her sleeping and came back down to camp for lunch. Bob was the lunch chef, and fixed venison burgers made from one of the coastal blacktail bucks he’d shot over on the Olympic Peninsula. That was some of the best venison that I have ever tasted! As we washed the burgers down with a cold soda, Clark told us that he thought the yaks might be holed up out of the wind (which was really picking up), hiding in some woods on the leeward side of a ridge that abutted the big pasture on top. We made a mental note to swing by those woods and do a little bird-doggin’. We also decided to go and see some other parts of the ranch that we hadn’t been to on this trip yet. After lunch, we headed out and went up the rocky road that goes immediately behind the ranch house.. We started seeing rams almost immediately -- Corsicans, Oregon Dahls, Merinos, 4-horns, etc. Then there were a couple of big Texas longhorns, and a shaggy old buffalo bull. This was a relatively sheltered part of the ranch, and the winds were really picking up (the forecast was for 60+ mph winds that afternoon), and the critters were coming down here to get out of the wind. But no yaks, and no hogs. We kept moving. Eventually, we broke out on the “main road” up near the top. It was really blowin’ now and we decided to follow up on Clark’s suggestion of working the backside of the ridge. I started up the 4-wheeler track, intent on getting Bob established on the right set of tracks, and then dropping back and letting him take the lead, in case we jumped anything. I was no more than 30-40 yards into the woods when I kicked up a big yak bull. Man, did I ever feel stupid! Bob got out in front and followed that big shaggy black bull up the hillside (and I hung back at the truck so as not to interfere with any more of Bob’s stalks). He came back saying that the bull was heading in the direction of the big pasture and that he thought there might be some other yaks up there, so we loaded up in the truck and headed up the hill. As we approached the big pasture, Bob looked over where he expected to see the yaks, and said, “Yup, there’s the 4 big bulls we saw this morning.” Wait a minute, these animals were all different sizes, and the 4 bulls were all the same size. Bob put the binocs on them and sure enough, this group was composed of a bull, a cow, a yearling and a calf (the calf “belonged” to a different cow that had already been taken, after the calf had been weaned; there was only one cow left and at 3 ½ years old she had never dropped a calf and was “dry“). “Glen, I believe we’ve found my cow.” Now we just needed to figure out how to close the half mile between us. A direct stalk was out of the question. We would be in plain sight the entire way, and we already knew that these animals were skittish. There was a slight rise above them, and if we continued up the road we were on to the big pasture on top, that rise should shield us until we got on the other side of the pasture. We could then work down a line of trees on that side and get into position for a shot. We were off. The 4 big bulls were up by the a stand of trees on the fenceline, using that as a wind break. We slowly drove past them at a comfortable distance so as not to spook them. We got up to the treeline and parked the truck out of the way (but in the direct line of the wind as it came over the saddle, it was blowing at 40+ mph out of the west at this point). The group of 4 bulls was out about 250-300 yards to the south of us, and the group of 4 yaks were a couple hundred yards east of us, moving into the wind to ultimately join up with the 4 bulls. The original plan had been for Bob to sneak down the edge of the treeline about 150 yards to get in position above his cow, and to shoot from there. With them moving (and covering ground at a deceptive pace), that was no longer an option. I hid in the bushes at the top of the hill, and Bob was able to sneak down to a shielded position about 50-60 yards to my left and set up on the edge of the treeline and let the yaks move into his field of fire. They were about 125 yards in front of us, moving at a steady walk from our left to right, and the wind was blowing 40+ mph from our right to left. Bob was shooting slightly downhill, from an open-legged sitting position, at a moving target, with a 40+ mph crosswind blowing straight out of 3 o’clock. Not the best of conditions to shoot in, but Bob managed to shoot well in spite of the conditions. His first shot hit the cow yak hard and stopped her in her tracks, with her head sagging. The other 3 yaks pick up their pace and started to trot off towards the 4 bulls. Bob quickly racked the bolt on his ‘06 and put a second 180 grain Partition into the cow and she went down hard. Both bullets slammed home loudly from my vantage point off to Bob’s side. With the second shot, the 4 bulls started trotting over to meet the younger bull, yearling and calf that were coming their way. As the two groups merged, they headed back over to the dead cow and started nudging her and kicking her to get her to get up and leave, warning her that there was danger in the area. When she didn’t respond, they got more and more intense, eventually to the point of hooking her with their horns and trying to flip her over! This went on for a full 5 minutes with Bob and me watching from the top of the pasture. They didn’t actually leave the dead cow until we got in the truck and drove down there and honked the horn repeatedly at them. They were none too happy about losing “the last girl at the dance”! Later we learned that Bob’s first shot had landed a little farther back than he had intended due to the severe crosswind, but still caught part of the liver (which is what slowed her down). His second shot center-punched her volleyball-sized heart and literally blew the backside of it off. The elapsed time between the first and second shots was no more than 3 or 4 seconds. Nice shooting! 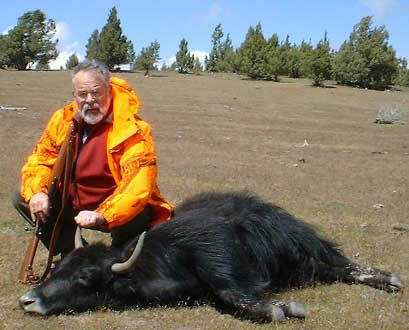 Bob and his 400 lb yak. Bob took the shot from the line of trees behind him. Clark came up with his 4-wheeler and trailer to haul the yak down to the skinning shed, and Bob and I moved off in search of hogs. So far, the only hog we had seen was the one big blonde sow, so we moved back down to the shelter of the catch basin at the bottom of the big bowl to see if there were any other hogs that had moved down to the shelter of those protected woods. We knew as soon as we parked the truck and started up the drainage that there were hogs in the area as we could hear an occasional grunt here and there. I was working into the wind, but that would put me directly downhill from their bedding spot, a poor position to evaluate size and shot placement. So I swung out parallel to the left so I could get alongside them without giving them my scent, and then I would “play it by ear” after I figured out what I was looking at. From the other side of the drainage, about 50 yards away, I could make out two large sows bedded down -- one dark brown and spotted, and the other a “dirty blonde”. Both were in the 450 lb range, and much larger than what I was looking for. Off in some brush a little farther beyond those two were another 6 or 7 hogs bedded down, including the blonde sow I had seen earlier in the day, along with a few more of similar size, as well as a couple that were smaller (one I guessed at about 150 lbs and one at about 250 lbs). This group was bedded down all bunched together, and there was no way that I could get a clear shot at any of them. The hogs were directly in front of me, with the wind coming straight out of 9 o’clock. I decided to cross the drainage to my left and put myself directly upwind of the two sows (but not the rest of the herd) and see if I could spook them “gently”, get them up on their feet, and then get a clear shot at that 250-pounder. The plan worked like a champ -- I quietly snuck across the drainage and as soon as I got up on the other side (directly shielded by several juniper trees so the two sows couldn’t see me), my scent wafted down to the sows and they sprang to their feet, using their beady little pig eyes to try to find the threat. The other hogs were off to my left, out in the open, but still crosswind to me. They didn’t see or hear me, but noticed that the two big sows were rattled, and so they started to stir and stand. When the hog I’d picked out stood up, he was quartering towards me (facing my right) and I had a clear 40 yard shot. I brought the OM SBH up, drew a bead just behind the right shoulder, and fired. The hog started squealing and jumping around in circles, doing pirouettes like a rodeo bronc. I’ve seen cases where mortally wounded animals have reacted this way, so my first reaction was that he was probably going down quickly. Such was not to be. After a few seconds, the herd gathered up and started moving off, up the drainage to my left. The wounded pig fell in with them and started trotting off with them, leaving a strong blood trail from his bloody left hindquarter (when I saw that, I thought that was odd as I would have expected my shot to exit at the back of the left-side ribs, but bullets sometimes turn inside an animal so I didn’t think too much about it). I ran to catch up with the herd, and got within about 15 yards of them, but they stayed all bunched up in the bottom of the creek channel, offering no clear shot. Suddenly, the wounded hog took off up the opposite creek bank, putting himself in the clear, only about 15 yards away. The Ruger .44 Mag came up and I drew a bead on his left shoulder and fired. Right as the hammer fell, the hog jumped uphill to gain more elevation on his climb, and I called that shot as a clean miss (low). However, the shot had an immediate effect of turning him 180 degrees and motivating him to now run, instead of trot, downhill and away from danger (I figured I must have sprayed rocks and gravel on him with the shot). I ran down the creek channel on the opposite bank. Now separated from the rest of the herd getting a clear shot was easy, and I put a 300 grain HP right through the middle of his ribs, flattening him instantly. He collapsed and tumbled down into the bottom of the creek, wedging himself in between two large rocks. With him down at the bottom of that creek, it soon became apparent that my original estimate of “about 250 pounds” was off by a bit, and this guy was more like 300 lbs. Clark came in with his 4-wheeler, and it took the three of us 30-40 minutes to get that hog out of that creek channel, and loaded up onto his trailer. I shudder to think what that job would have been like without Clark’s 4-wheeler and trailer. Back at the skinning shed we were able to piece together what had happened with my hog. Plain and simple, I jerked the trigger on that first shot, and pulled it low and a little left. It had gone in below the ribs and just creased the belly, then hit the farside (left) hindquarter, where just by pure luck it had hit the femoral artery (hence the strong blood trail). This wound would have eventually proven fatal, but only by random luck. The second shot had indeed gone low (just as I had called), but it had hit a rock and ricocheted straight up vertically into the left “armpit” of the boar, and traveled up in between the shoulder muscles and the ribs, doing substantial damage to a lot of meat in the ribs, but not doing much that would hasten porky’s demise. The third shot entered the center of the right side ribcage and exited in the rear portion of the ribs on the left side. The 300 grain cast HP expanded well, did extensive damage to both lungs and punched right on out the other side. Clark had most of the skinning chores done before we got back down to camp (he’s fast with a knife!). It got down below freezing that night, so both the yak and the hog chilled down quite nicely. Dinner that night was pan-fried steaks (much too windy to grill over the campfire like we had planned) and salad. Sleep came easily for me that night. After a hearty breakfast the next morning we got Bob loaded up and on the road, and then I sat down and butchered my hog for the trip back home. On this trip I was using a Dozier Professional Skinner that I had just bought from a friend of mine down in Texas. For many years I have heard of the reputation of Bob Dozier’s knives and the exceptional edge retention resulting from his heat treatment of D2 steel to 60-61 Rc. I’ve always wanted to work with one, but had just never “pulled the trigger” and bought one. Well, Mark offered one up for sale earlier this spring, and it was even the model that I favored, so I just decided that the time had come, and mailed him the check. The Dozier Professional Skinner performed beautifully while I was butchering this hog. I never once had to touch up the edge, and it still shaves after cutting all that pork. This is a magnificent knife! OK, there is one thing that I’m not real crazy about, and that’s the Kydex sheath. I must confess to being something of a traditionalist and preferring a simple leather scabbard for my hunting knives, and Kydex tends to make me think “tactical wannabee“. I understand the functional appeal of Kydex, it’s just that it lacks the beauty and class of a fine leather sheath. 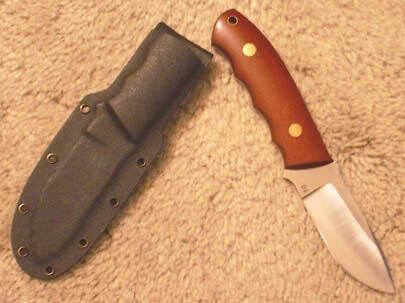 This particular knife is housed in Dozier’s Vertical Kydex sheath (the default sheath for this knife is the Horizontal Kydex sheath). I have to say that this sheath has all the esthetics of a rusty bumper-jack that’s been rattling around underneath the seat of an old 1967 Ford work truck. But like that bumper jack, it does its job, and does it well. After wearing this knife (and sheath) for 2 days hunting, I can honestly say that it’s the best functional sheath I’ve ever used -- the counter-radiused belt loop holds the sheath (and knife) up snug to the body (I don‘t like “floppy“ sheaths), it provides rapid and positive access to the knife, and it provides excellent protection from the razor sharp D2 blade. In short, it works, and extremely well. I guess I can learn to live with its homely looks (besides it’s on the backside of my belt, so I don’t have to look at it when I’m hunting!). Warning: All technical data mentioned, especially handloading and bullet casting, reflect the limited experience of individuals using specific tools, products, equipment and components under specific conditions and circumstances not necessarily reported in the article or on this web site and over which The Los Angeles Silhouette Club (LASC), this web site or the author's has no control. The above has no control over the condition of your firearms or your methods, components, tools, techniques or circumstances and disclaims all and any responsibility for any person using any data mentioned. Always consult recognized reloading manuals.